Scientists have discovered a fast-moving deep ocean current with the volume of 40 Amazon Rivers near Antarctica that will help researchers monitor the impacts of climate change on the world's oceans. A team of Australian and Japanese scientists, in a study published in Sunday's issue of the journal Nature Geoscience, found that the current is a key part of a global ocean circulation pattern that helps control the planet's climate. "We didn't know if it was a significant part of the circulation or not and this shows clearly that it is," one of the authors, Steve Rintoul (CSIRO, Commonwealth Scientific and Industrial Research Organisation), told Reuters. Rintoul, of the ACE-CRC (Antarctic Climate and Ecosystems Cooperative Research Center) in Hobart, said it proved to be the fastest deep ocean current yet found, with an average speed of 20 cm (7.9 inches) a second. It was also found to carry more than 12 million cubic meters a second of very cold, salty water from Antarctica. "At these depths, below three kilometers (two miles) from the surface, these are the strongest recorded speeds we've seen so far, which was really a surprise to us." 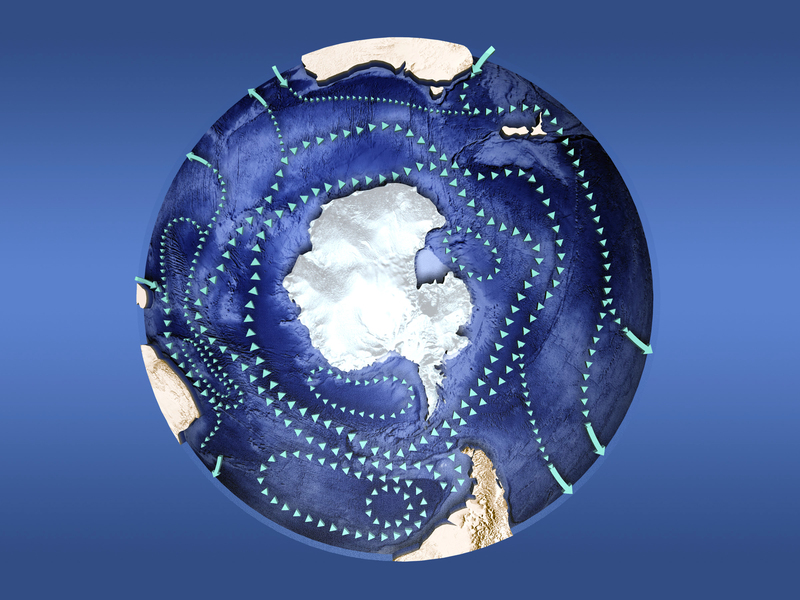 The current forms part of a much larger network that spans the world's oceans, acting like a giant conveyor belt to distribute heat around the globe. The team deployed measuring devices anchored to the sea floor at depths of up to 4.5 km (3 miles) and recorded current speed, temperature and salinity for a two-year period. "The continuous measurements provided by the moorings allow us, for the first time, to determine how much water the deep current carries to the north," Rintoul said. He said a key issue for predicting climate was whether the overturning circulation was going to stay at its present strength or whether it was sensitive to changes as climate changes. That meant further improving measurements of the speed and volume of the cold, salty water that is created around Antarctica. The Federal Aviation Administration (FAA) announced that one of the two WAAS GEO satellites will drift out of usable orbit within two to four weeks. Earlier on April 8th, Intelsat announced it had lost control of its Galaxy 15 satellite that hosts the WAAS SBAS transponder used by the FAA. The FAA says it is monitoring the satellite, but that failure is imminent (by mid-May 2010). When G-15 is out of usuable orbit, WAAS will be disrupted for users in northwest Alaska. The rest of the WAAS service area — U.S., Canada, Mexico — will operate normally but will be reduced to a single point of failure with only one WAAS broadcasting Anik F1R satellite remaining (PRN #138/NMEA#51). So it seems recommending that all users should be locked onto PRN 138. For those users that have GPS receivers with the ability to track either one of the above PRNs, it would be best to remove PRN#135 (NMEA#48) as an option. For the short term, 138 will be the only option. Longer term, there will have other options (PRN#133 today in test mode until the end of the year). Note : there are two numerical designations for each WAAS satellite. PRN numbers identify the code transmitted by the satellite while the NMEA SV ID designation which is a proprietary format is simply the PRN minus 87. Garmin for example uses the NMEA number. The impending failure of this satellite—which only affects WAAS signals—comes at a time when there are questions about the regular GPS constellation. The U.S. Government Accountability Office has said that many of the older satellites currently in use could reach the end of their operational life faster than they can be replenished, resulting in a drop below the number of satellites needed to meet some GPS users’ needs, as early as this year. For more information, see the FAA’s “WAAS Intelsat GEO Outage Impacts” presentation. Garmin : what is WAAS ? A would-be sailor bought a motor cruiser on the internet then set off on a round-Britain trip armed with nothing more than a road map and a radio he didn't know how to use. Little wonder then, that the bungling mariner took a wrong turn shortly after setting out from Gillingham and ended up circling the Isle of Sheppey. The 45-year-old man, who has not been named, had to be rescued after running out of fuel have gone round the eight-mile wide island for a day-and-a-half. 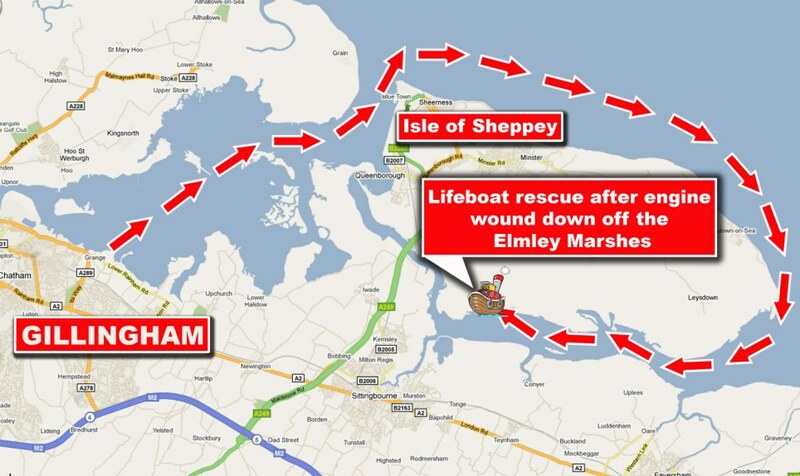 Rescuer Tom Ware said: "Because he had no chart, his general principle was to keep the land on his right, except he didn't realise Sheppey was an Island." "It took him a day-and-a-half to get from Gillingham to where he ran out of fuel." The boat only had a 20-litre fuel tank and a 20 horse power engine - not designed for sea use. The sailor thought that because he could drive in his car to Southampton using a single tank of fuel, he only needed one tank of fuel for the vessel. He also made the mistake of taking a VHF radio, but did not know how to use it and he had no provisions onboard. Coastguards, who met the man at Queenborough, advised him that engine sizes and therefore fuel consumption differs and the coast route was longer than the road distance in any case. Coastguard Ian Goodwin said: "We passed on relevant safety advice and advised him that the best way to Southampton would be by train." "However, he said he would get some fuel and get under way but asked us if he went left or right when he came out of the Swale." NASA's Aqua satellite captured this image of the Gulf of Mexico on April 25, 2010 using its Moderate Resolution Imaging Spectroradiometer (MODIS) instrument. 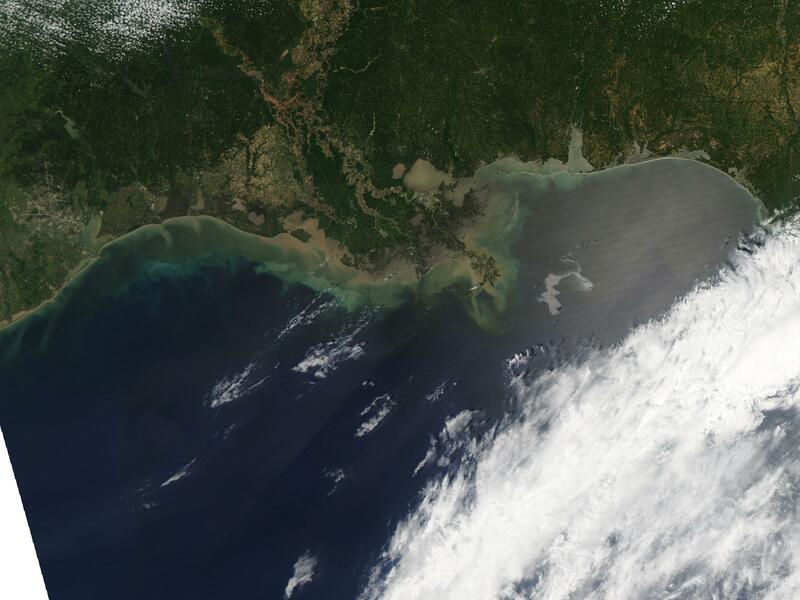 With the Mississippi Delta on the left, the silvery swirling oil slick from the April 20 explosion and subsequent sinking of the Transocean Deepwater Horizon drilling platform is highly visible. The dramatic oil rig explosion and fire aboard the platform rig 50 miles off the Louisiana coast illustrates the growing risk for oil companies as they drill ever deeper into the earth's crust to satisfy domestic and international demand for fuel. "Deep water drilling is already a high-stakes casino and as geologic risk, capital risk, market risk and engineering risk all come together, they are becoming extraordinarily difficult to quantify," says Robert Bryce, an energy expert at the Manhattan Institute and author of the upcoming book "Power Hungry: The myths of 'green' energy and the real fuels of the future"
A dark and rainy, eels leave fresh water to begin a long and last trip of 6000 km to its breeding ground, the Sargasso Sea. How are the eels they can find their way into the Atlantic Ocean? Researchers may have found the answer: the eels would use the Earth’s magnetic field. European and American eels breed both in the deep water and salt. The spawning area and the zone of growth have not always been so remote, but the drift of continents has forced the eels to dramatically increase their travel time (5-6 months) to reach the Sargasso Sea. To date, no adult eel has been caught or even seen in the Sargasso Sea. This area is extremely broad and deep, making it expensive and difficult expeditions. Several attempts at tagging were held but no individuals have been followed long enough to determine the exact location of reproduction. However, these markings have shown impressive swimming depths of up to 600-700 meters, “says Caroline Durif, a researcher at the Institute of Marine Research in Norway Austevoll (Havforskningsinstituttet). Today, the eel has kept all its mysteries. For 2,000 years, scientists are asking questions about its reproduction. Heeding neither larvae nor eggs, Aristotle thought that the eel had no gender (neither male nor female), it was an example of spontaneous generation, caused by the putrefaction of algae. In the late 1800s, the first larva of eel has been identified in the Mediterranean. From other eel larvae (leptocephali) were harvested in Atlantic. It was not until the early 20th century a Danish oceanographer (Johannes Schmidt) found, after years of sampling, that smaller (younger) larvae were located in the Sargasso Sea and that s’ therefore acting in the place of reproduction. But how eels are they then able to find these clear waters? Starting from the Norwegian coast, this is a journey of about 6000 km. Animals have many ways of moving in space. Some sail through the stars, others through their nose, or by following the ocean currents. But for a fish swimming at great depths, the earth’s magnetic field provides a reliable and this day and night. The eels, which come from localities far apart from each other (northern Norway, Morocco, not from Mediterranean countries) require a navigation system for effective and accurate return to the same place and same time for reproduction . The perceived intensity of Earth’s magnetic field is theoretically possible to sail to the Sargasso Sea. It is likely that eel integrates a sort of map for the journey, she will use to return, “said Caroline Durif, is the assumption that it has tested with his colleagues at the Institute of Marine Research . This lab is almost unique in the world (this study and the experimental setup have been funded by the Council for Scientific Research Norwegian: Norges forskningsråd), magnetic north is changed each night to test the effect of orientation of the eel. Eels are isolated in a basin in the dark during their migration period in autumn. The coil giant to change the direction and intensity of the magnetic field, then by an infrared camera to observe the behavior of the eel. Caroline Durif was initially surprised when eels oriented themselves preferentially towards the east and north, which was simply not the direction of the Sargasso Sea (southwest). However, these directions correspond perfectly to those that have been taken out of the fjord or the eels were caught. It seems that the young eels learn the way to go back to the opposite when they leave the rivers and inland waters, “she says. It is a discovery that has important implications for the management of this endangered species. The current management measures advocated moving the young eels which are located in areas at risk to less polluted areas, where fishing is less important and dams absent. But if these individuals are suddenly moved to unknown areas they would not find no way back and are therefore unable to reproduce. The study showed that the eel was sailing through the magnetic field. This intensity varies with latitude and allows the eel and other animals to determine their position on the earth. It’s a bit like a GPS, “says Caroline Durif. For now, researchers do not know the precise physiological mechanisms behind this system or any component of the magnetic field is perceived by the eels. Eels are not sexually mature when they leave the inland waters. The factors that trigger this maturation are not known and is one reason why the European eel farming is far from being controlled. Experiments have shown that the magnetic field can affect the physiology of migratory species. Durif intends to examine the effect of the magnetic field present in the Sargasso Sea on the onset of sexual maturation. 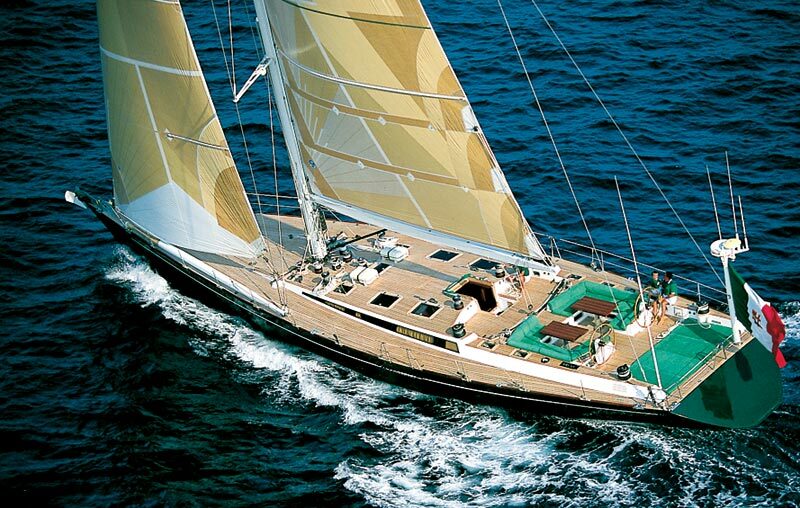 A regatta in Portofino on Wally yachts : what else ? Next month will see the launch of the Nespresso Cup , a new international regatta gathering for the very first time exclusively the Wally Class. Peyron commented: "I've always found Wally Yachts very seductive, and am looking forward to finally experiencing them first hand on the race course during the Event. The spectacular venue of Portofino will be the perfect location for such an event." In 1989, I met Mr Luca Bassani Antivari, founder of Wally Yachts onboard of a custom Baltic yacht which he christened 'Wallygator' for the cartoon character his children loved, just before he decides to build (with Luca Brenta yacht designer) a brand-new Wallygator, an innovative 83-foot carbon fast sailing composite sloop in a 'Wally style' (now named Mr Gecko). This first Wally yacht proved to be fast and easy to sail, the 'flush deck' was as cleared as the one of an aircraft carrier, and Luca Bassani got a yacht on which he could cruise shorthanded with his family, but also allows him to compete around the buoys in maxi races or in transatlantic events. Sailing aircraft or flying yacht ? 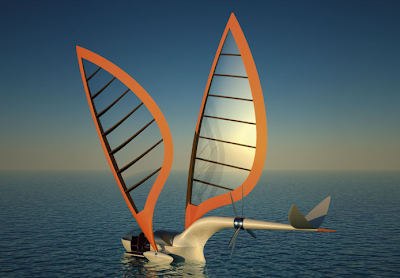 Some aircraft called S4-sail-6P, convertible in sailboat has been designed by Octuri (aka Yelken Octuri), who usually works in aeronautic industry in Toulouse (France) and wanted a four-seat aircraft that can be transformed into sailing at will. The wings of the aircraft become the sails of the boat, they are indeed able to stand up and bow at different angles to follow the wind direction. The aircraft has two propellers, which are arranged on the tail of the plane, one behind the other. The cockpit can be opened during the boat trips through a sliding glass canopy and finally, both located under the glass roof panels can be arranged in a horizontal position for the amphibious boat mode, in order to enlarge the living space cockpit. Futurist concepts for the pleasure to dream.